Happy WIP Wednesday, all! I am happy to report some progress as well as the start of my first new, non-sock project from my Year of Projects list. First off, the Random Washcloth and the Color Affection shawl look much the same as before, just bigger! (Read: I forgot to take photos, woops!) Now on to the rest. 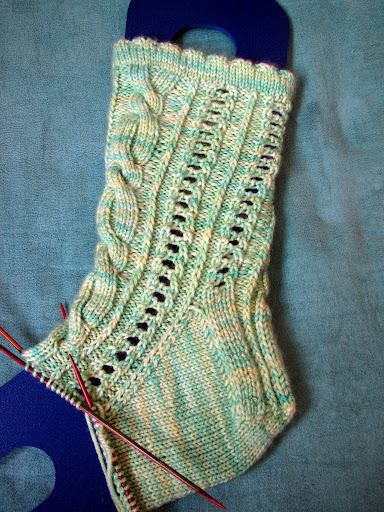 My Lillypad Socks are progressing well. I just finished the gusset and am at the point where I want to do some different fancy patterning on the foot, so they are waiting for me to have a free evening to really focus on them. 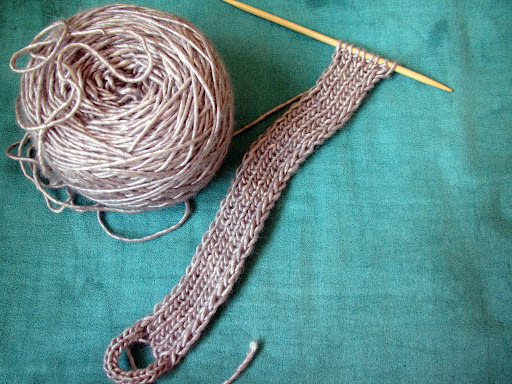 It’s tough when none of my projects are in the pick-up-and-run stage of knitting, so I started a new one! My first new Year of Projects project is the Regina Hat by Carina Spencer. It’s a free pattern that begins with the hat brim knit lengthwise with the body of the hat picked up from it’s edge. It’s a really neat design and I’ve been wanting this hat for basically forever, I was just waiting to snag this exact colorway because it’s the perfect compliment for the color I’m planning to use for the body of the hat. SG Codex is a discontinued yarn, but The Verdant Gryphon is going to offer it on a limited basis sometime this month. It’s fantastic stuff, a dense and drapey blend of BFL wool and silk that is really quite dreamy. Also, if you’ve never knit any of Carina’s patterns before, I recommend Zuzu’s Petals, Whippoorwill, and Catkin (the first two I’ve knit, the last one is on my list). She does some lovely work. 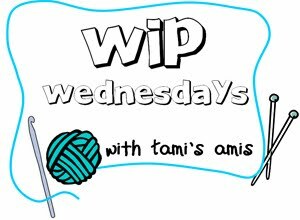 I have a spinning-related WIP that I debated adding here, but I think I’ll hold off until my next post so that I can properly gush about its wondefulness. 🙂 Until next time! Click here to see what everyone else has going on! I love the Lillypad Socks. Pretty pattern, pretty colour! I'm looking forward to the release of the Lilypad socks– both because they look like fun to make and because I adore that show! I have a little codex in stash from a year+ ago, but I haven't used it yet– does it tend to make a heavy and very warm fabric? So many pretty socks, I'm enjoying watching both pairs knit up! I'm very excited to hear more about your exciting spinning project! So pretty. Your yarn all looks so soft and squishy. It seems to go to your profile and then I can click on “My Webpage” to get to your blog. I have no real idea how to change the way the comments work but I'll look into it. 🙂 Still fairly new to the blogging thing. Also, yes, codex is quite warm. It's not very thick, on the light worsted side, but the silk makes it toasty. Thank you! I should be finishing it up tonight, yay. Haha! To a new designer, that's kind of wonderful. 🙂 Glad you like and I will be knitting them up as fast as I can. Thank you! I am kind of addicted to those yarn bases. Such good stuff. Thank you! I can't decide either, which is why I work on them all just a little bit at a time. Everything looks wonderful, as always! I am anxiously awaiting the release of your Lillypad socks pattern. 🙂 Also, I've never knit with Codex before, but WOW, does it look totally luscious to work with! I may be stalking the Verdant Gryphon webpage in hopes of snagging some! All of it looks gorgeous! I love that pinkish yarn it is just so luscious looking! Also both of those socks just look completely beautiful. They're doing a Codex update tonight at 9pm, but it's a custom dye situation so you have to purchase 4 skeins (eek, pricey) and choose your colorway. They will most likely sell out instantly but they'll have single skeins available soon, too. When those lillypad socks are out, I will very likely get them. I LOVE that pattern you are creating and the yarn you chose compliments it so well. Lillypad socks are ever so pretty. 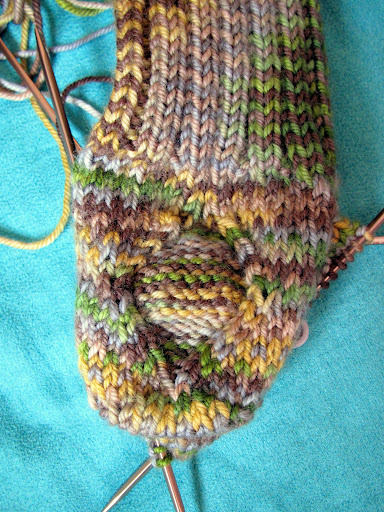 Since I have never even knit a pair of socks, the idea of designing them is enough to send me into fits. What talent you have! Those Sasquatch socks are very cute, love the heel! And the lillypad socks look great.